Undoubtedly, readers of this blog have already read Marco's post from last week, but in case you missed it, we've recently made an announcement about the future of HDL. Hearing from the community around HDL in the wake of the announcement has been encouraging. Thanks to all of your for your continued interest in our work. I hope we are able to sustain it for the next five and a half months because we have no intention of slowing down. On the contrary, there's still lots to do. With the ending point for HDL clearly marked on the horizon, we're entering a kind of Benjamin Button mode. We'll be getting back into the habit of writing how-tos, working from practical issues ("how to budget a project", "how to brief a photographer") through to some of the more fundamental aspects ("what abilities are needed in a design lab", "how do you pick projects"). We'll be talking through and explaining how we set up HDL so that the site becomes as useful an archive as possible for others, elsewhere looking to do something similar. Marco and I have been spending time at the whiteboard tracing out a loose plan for the HDL closing event on June 10th. It's going to be free and open to all, so I hope you'll sign up and consider joining us. We're also keen to hear your feedback and questions about HDL and the work we've been doing. This will inform our efforts to ramp things down. Back on the whiteboard, we've also been revisiting our proposed table of contents for the forthcoming book on stewardship as well as generally trying to get a handle on all the things we want to do before sweeping the floor and turning out the lights. Tomorrow we'll have a conference call with Justin and loop him in. This is one of the ways we usually work: a couple people bat ideas around until there's something there, then we make a little presentation to the others and start over. 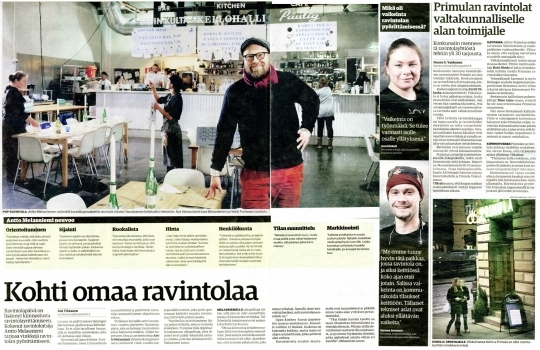 Open Kitchen got a nice write-up in Kauppalehti recently. We're happy to see the Facebook group for the participants still active and are hoping to join them for a small reunion next week. Right now Mariaana, a journalist we asked to sit in on the programme, is writing up notes from each of the courses and we will be publishing those online as soon as we can. Next week we're also hosting a small gathering with some local stakeholders to see if we can find a more permanent host for the programme. This blog post is the second of the night, behind what I just put up on the Brickstarter site. 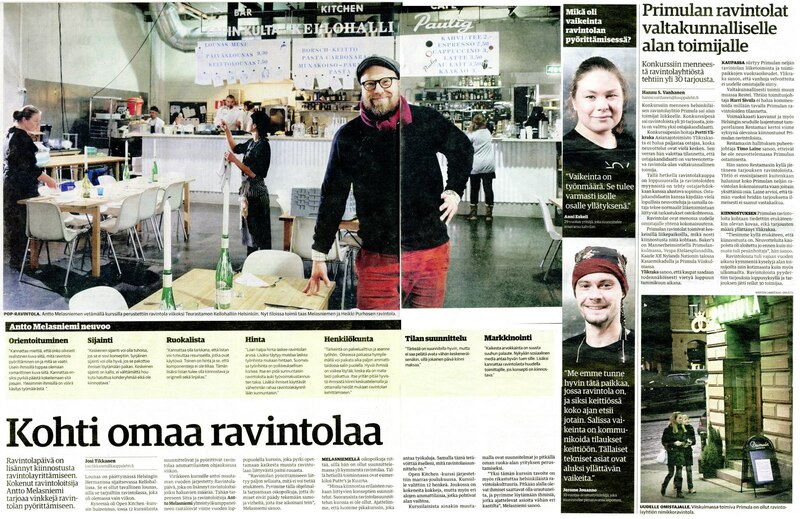 Over there we announced that Sitra will be publishing a Brickstarter book in 2013 (yup, more writing) as well as beginning a very small experimental effort with the city of Kotka in eastern Finland. My main focus at the moment (and through much of the holiday) is getting the manuscript into shape. We're using the blog as a starting point for that, but revising and updating things with new content as well as making sure they work equally well on the page. I particularly enjoyed writing the introduction, which includes the epic battle between wind turbines and glider squirrels. You'll have to read the book to find out who wins. 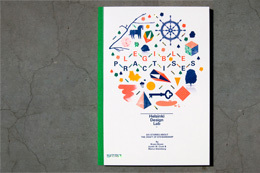 We've also been working on a quick project with Two Points, the graphic designers who created the HDL visual identity. I'll leave the content of the project a surprise for now, but here's a small clip from one of the files they sent. It's part of a poster. Next week Marco takes off on a trip to the US where he will be participating in the By Design event at Harvard. He'll also meet with some people at MIT and make a visit to the Cleveland Clinic, which is now testing some of the ideas developed during Stroke Pathways, a project that Marco led at Harvard (and Justin and I contributed to) which laid the groundwork for our strategic design approach here at Sitra and HDL. We're anxious to hear how it's going there. On the theme of travels, we're going to make an effort to be out and about even more than usual in the coming months. If you're interested in having an HDL or strategic design perspective at an event near you, drop us a line. No promises, but we'll try our best to be accommodating.